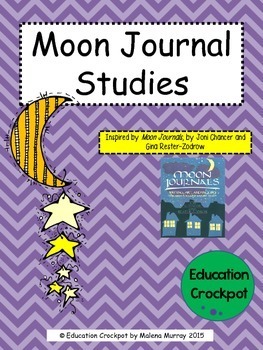 Education Crockpot presents creating a Moon Journal with your students. This is the easiest way to combine descriptive writing, art, along with science in a way that motivates students. 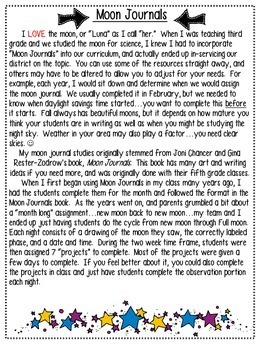 Using Joni Chancer and Gina Rester-Zodrow's book, Moon Journals, as inspiration, this packet allows you to jump right into working with a Moon Journal with your students. *This is a two week assignment of the discovery/observation of our beautiful moon...from new moon until full moon. 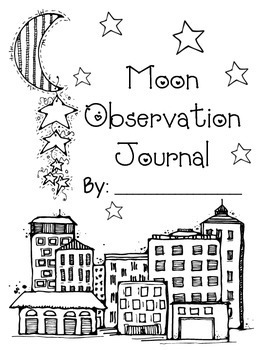 *Students will observe the moon each night and record their findings. They will also complete 7 "projects" that go along with their studies. All projects include a writing component as well as some type of artwork that students will get to choose. 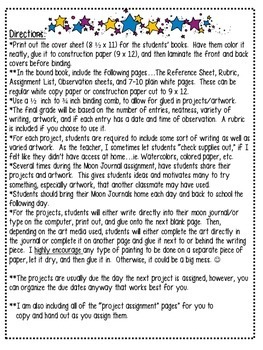 *Directions are included for each "project," as well as a rubric, observation sheets, and cover page.